Development and production funding for screen stories. 11 outstanding projects have been selected by Metro Screen to receive $115,000 in funding through the Breaks - Story to Screen program this month. The comprehensive Breaks funding program is focused on getting stories from script to screen with a cash production budget, production facilities support and a craft skills development program including the Story Hothouse and the Directors Foundry. Over the past three years, Metro Screen has been funding creative storytelling and emerging practitioners through the First Breaks, Break Out and Breakthrough programs. The Storyworld Studio is an intensive development program for interactive multiplatform stories, an Australian first pioneered by Metro Screen and Mike Jones, winner of the UK ICTommorow Digital Innovation award for Film & TV last year. Limited places are available at this unique structured development studio, subsidized by Screen NSW and Metro Screen. Belvoir and Metro Screen are proudly collaborating to present a Theatre and Technology Mixer at the Vivid Ideas Exchange happening at the Museum of Contemporary Art Monday 27 May. Bringing tech-savvy multimedia producers together with contemporary theatre creative to network and workshop new models. Working on a great feature script, but struggling to nail down your final draft? Well, you know what they say: writing is rewriting. The Script Sessions is a series of intensive one-day workshops designed to take your feature script to the next level. A rare opportunity to work one-on-one with professional story analyst and screenwriting teacher Karel Segers. Places are filling fast. They say it takes 10,000 hours of practice to become a genius at something, so if you are between 11 – 17 years old, now is the perfect time to start! Under the watchful eye of a highly experienced filmmaker, kids learn how to take a story from script all the way to screen. They get to make either a short film or trailer or behind-the-scenes documentary. 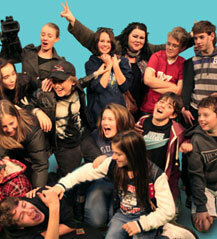 Have a chance at trying different crew roles at this very interactive, hands on creative school holiday course. This workshop is fantastic for boosting self-confidence, while working on a creative endeavor with new friends. Participants will gain lots of new skills while building on existing ones. Limited places book now. Armed with the basics of screenwriting and a script you have been working on, you will make the leap to Intermediate Screenwriting. This part time short course is an extended writing opportunity to develop strong narrative and story elements for effective storytelling. Come away with a thorough working knowledge of structrual and technical basics as well as the ability to transform your ideas into commercially viable scripts. To take this course you need to bring a script: short, feature, TV, treatment or a project at a stage of development you can progress with. The FlexDrop chroma key green/blue background is a double-sided portable solution for keying work. It is wrinkle-free, with a semi-matte fabric that does not reflect green onto the back of your model or subject. The FlexDrop® pops into shape and maintains a rigid flat surface that can be clamped or hung from a LiteStand, doorframe or leaned against a wall. Panel is guaranteed to open flat and folds down to 1/3 its size for storage in its own carry bag. Producer – Screen Cultures: ICE is seeking an experienced and innovative Producer to guide the development, production, management and evaluation of a range of screen-based activities, programs and events. This position will work with a diverse range of screen artists, organisations and communitiesfrom Western Sydney. Click here to download the Position Description. Applications close 3 May. The Korean Cultural Office (KCO) Australia invites applications from anyone who are artists and film enthusiasts. We are welcoming you to create a storyboard drawing of your own visualization of a mystery script from a Korean film (to be revealed) and your work will be exhibited at the KCO on Elizabeth Street for FREE. Kino Sydney is an open-mic night for ﬁlmmakers, place for filmmakers and film-lovers to network, meet cast and crew and watch great short ﬁlms. Kino provides ﬁlmmakers with the equipment and support to write, shoot and edit their projects as well as the opportunity to show their work to a large audience. Each event includes live entertainment and giveaways. Opening in cinemas on 25th April, this delicious drama with a generous pinch of comedy is based on the extraordinary true story of President François Mitterand’s private cook. Hortense Laborie, a renowned chef from Perigord, is astonished when the President of the Republic appoints her his personal cook, responsible for creating all his meals at the Elysée Palace.